One of the biggest benefits of using a sump set up is the amount of control you have over the entire system. You can use whatever kind of filtration you want to tailor it to the specific needs of your tank. If you’re working on a new aquarium and sump system, one of the most important things to invest in is the best aquarium sump pump. It’s essential to make sure that the system works as well as it possibly can. How to Choose an Aquarium Sump Pump? When it comes to sump pumps, finding a reliable, effective option is the key to your whole filtration system. It’s very important to choose the right one. Here are some of the best ones we found. There are a lot of really great things about this pump from Fluval. It’s designed to keep water flowing between the aquarium and the sump powerfully and smoothly for the best possible filtration. In order to prevent heat transfer that could alter the temperature of your tank, this pump runs cool and has a low-heat transfer. Plus, it’s designed for submersible or dry use. Cool operating temperature and low heat transfer won’t affect the water temperature in your aquarium. This pump has been engineered to deliver powerful flow rates at various head heights. The threaded fittings are compatible with both North American and European hose fittings. This pump was designed for submersible or dry use. There are no exposed metal components so you don’t have to worry about rust or corrosion. This pump runs a little louder than expected. The flow rate is not as expected in some setups. It’s larger than some comparable pumps and you may need to rearrange you set up to fit it into the sump. There’s no filter cap included for the intake. This sump pump from Aqueon has an adjustable flow rate that makes it a good fit for a wide range of sumps and aquariums. In fact, it’s a good choice for everything from household fountains to large aquariums that need additional filtration. Aqueon developed and tested this design for over 2 years to make sure they got it right. The flow rate is adjustable from 316 to 608 gallons per hour and it fits both ¾-inch and 1-inch flex tubes making it really versatile. This is an affordable pump that’s great for anyone who’s trying to stick to a budget. 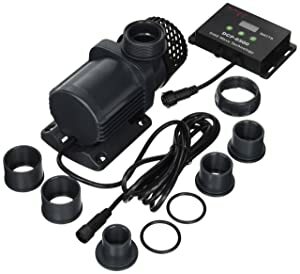 Straightforward set up makes this a great pump for beginners but experienced aquarists will loke how easy it is to modify. This pump is fully submersible and ideal for both freshwater and saltwater setups. The compact size is easy to fit into most sump setups. This pump can run warm which may raise the temperature in the sump and eventually the aquarium. It can be loud depending on the setup of your filtration system. For a powerful pump that actually runs quietly and energy saving technology, check out this DCP Since Wave pump from Jebao. 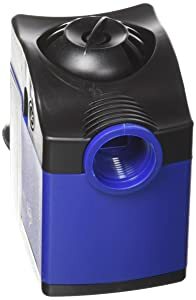 Because there are no copper components, this is a great pump to use internally and the max flow of 1710 gallons per hour makes this a great choice for larger setups. It’s available in smaller and larger sizes, too. The high-performance motor is really powerful and runs on 50% less energy than previous models. This pump is designed for internal use and, because it has no copper components, it’s completely safe. This pump runs super quietly and can be completely silent in certain setups. Recall memory remembers the settings when turned off and on again. You can turn down the power when it’s time to feed. Runs cool so you don’t have to worry about affecting the water temperature. Included instructions are poorly written. The controller is not always effective at adjusting flow. Leaks can occasionally occur at the treads. Pressure can fluctuate over time. This pump is designed to only run internally. This sump pump from Eheim was designed to run both inside and outside of water making it versatile enough for most sump setups. It has an integrated pre-filter that protects the impeller from debris, preventing damage and extending the life of the pump. These pumps are known for their reliability and are even used in professional applications, like in zoos and aquariums. The universal design has a wide range of uses and works with a wide range of connections and fixings. This pump can operate inside and outside of water and the motor is hermetically molded for complete safety. Thanks to the pre-filter, large debris is kept out of the impeller which prevents damage and helps to prolong the life of the pump. The prefilter is removable so you can use your own setup if you prefer. The motor was designed for low energy consumption and operates silently and efficiently. These pumps are some of the more expensive options available. Another great pump is the DEP-4000 from Uniclife. This high-performance pump includes a wear-resistant ceramic shaft and uses up to 65% less energy than comparable pumps. A smart controller allows for speed adjustment and has a 10-minute pause setting for feedings. The wear-resistant ceramic shaft helps extend the life of the pump. A memory function keeps your settings with every restart. The high-performance motor was designed for efficiency and uses up to 65% less energy than comparable pumps. Smart chip control turns the pump off is the motor is blocked or if the pump is dry. In most cases, this pump operates very quietly. The intake screen acts as a pre-filter to keep debris out of the system. It’s recommended that this pump is only used when submerged as the water keeps the pump running cool. This pump can make some noise when running at maximum capacity. The plastic body is fragile and will break if dropped. Before we get into how to choose the right sump pump, it’s important to first understand what a sump is for so that you can figure out whether or not you really need one and what kind of setup would benefit your tank. What is a sump for? There are a few different uses for an aquarium sump. They’re usually located underneath or next to the main aquarium because the water gets cycled from the aquarium to the sump and back again. A sump can be used as a separate area to keep all the equipment your tank needs to function so that you don’t have to take up any precious space inside the tank or deal with anything unsightly hanging off the tank. A sump can also be used to set up a filtration system and is an effective way of increasing the water volume to have a more stable setup which is especially useful when you’re working with something more delicate like a reef tank. What things should I look for when choosing a sump pump? 1. Submerged or dry? Some sump pumps have to be submerged to work properly while others can run wet or dry. This is completely based on personal preference but you should have an idea of what your set up will be before you decide. 2. Rate. How many gallons per hour of flow do you need? A lot of these pumps are adjustable and give you a little wiggle room but making sure the pump is powerful enough to support your setup is essential. 3. Prefilter. Prefilters are very important because they protect the inside of the pump from debris getting in. Some of these pumps have one included. If not, you’ll have to supply one of your own. 4. Running temperature. Because your sump pump comes into contact with the same water that circulates through your aquarium, it’s important that it runs cool so that it doesn’t affect the water temperature. 5. Sound. 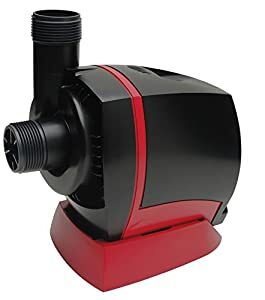 Generally, it’s preferable to have a pump that runs quietly so it doesn’t disturb you or the fish and other creatures you have living in your aquarium. A lot of these pumps are pretty quiet but that’s not always the case. Getting the right sump set up can make your aquarium easier to maintain and keep the water perfectly balanced so your fish and coral thrive. The most important part of any sump system is the pump. To make sure you get the right one for your aquarium, take a look at our buying advice and then check out the great products in our reviews.